Average credit card rates offered to consumers for new accounts climbed in the last two weeks to a record high, according to the latest survey by IndexCreditCards.com. The average rate offered to consumers for new reward credit cards and non-reward credit cards inched up to 16.88 percent, up from 16.86 percent two weeks ago. Although slight, the movement nonetheless pushes the average rate to the highest on record since IndexCreditCards.com began tracking credit card rates in 2005. The increase in overall consumer rates was due to an uptick in the average rate offered to consumers for non-reward credit cards. That average moved up to 15.32 percent from early January's average of 15.25 percent. 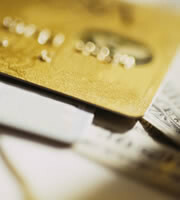 The average rate offered to consumers for new reward credit card accounts stayed at 17.55 percent. Generally, rates are higher for reward credit cards to offset the costs for cash back, free merchandise and other incentives credit card issuers offer card holders. The average rates for new business credit cards remained parked at 14.72 percent for non-reward credit cards and 16.21 percent for reward credit cards. Although they remained stable this month, business credit card rates have risen faster than student and consumer credit cards in the last year. The average rate for non-reward business credit cards was 13.39, and the average rate for reward business credit cards was 14.53 percent in January 2010--more than a full percentage point below their averages today in both categories. Business credit cards were not included in the Credit CARD Act, the landmark federal legislation that went into effect in 2009 and 2010. The law banned some of the most consumer-unfriendly practices of credit card issuers, such as hiking interest rates on existing balances. Some credit card issuers have voluntarily extended the law's consumer protections to business customers, but they're under no legal obligation to continue that practice. Student credit card rates also remained stable in the last month and have risen much more slowly than business and consumer credit card rates in the last year. Today's average of 16.23 percent for new student credit card accounts is just slightly above the 16 percent average of one year ago and the same as it was six months ago. Under the Credit CARD Act, credit card issuers can't issue cards to college students under 21 unless they have sufficient income to take on debt or have an adult co-signer for the account. IndexCreditCards.com takes into account all the various rate tiers for the credit cards included in the survey. Many credit cards feature two to three different purchase rates for the same card. Applicants with the best credit scores qualify for the lowest rate in the tier, and applicants with less-than-perfect credit are offered the higher rates. An issuer may advertise a credit card with rates "as low as" 11.99 percent, for instance, but in the fine print of the account disclosures include rates of 16.99 percent and 19.99 percent for those who don't qualify for the best deal. Financial institutions represented in the survey include American Express, Bank of America, Capital One, Chase, Citi, Discover, HSBC, PNC/National City, Iberia Bank, Simmons National Bank, U.S. Bank, Wells Fargo and more. 0 Responses to "Credit Card Rates: Average Rates Inch Up"